The Goliath Grouper, a large fish (sometimes up to 4′ in length!) is the subject of an endangered species debate in the Gulf Coast of Florida. A popular attraction for scuba divers, spear divers and fishermen complain that the population growth of these fish are putting their catches at risk. The Goliath Grouper has been listed as Endangered by the United States since the early 1990s, which is relatively recent. Experts argue that there is simply not enough data on Goliath Grouper populations to understand if the population is recovered, and if there are enough to start hunting. This begs the question: should Goliath Groupers be delisted as endangered species? Which should matter more, conservation priorities or economic considerations for fishing catches? And what about the economic impact of scuba diving tourism centered on the presence of these creatures in the Gulf of Mexico and Caribbean? This article was written and submitted by Stephanie Stefanski. Please check out her blog on marine conservation. I never thought a fish could be charismatic. Unique, beautiful, strange, awe-inspiring are certainly words I have used to describe fish, but charismatic? Usually such a term is reserved for the most noble, or heart-warming of creatures, such as gray wolves, bald eagles, the giant panda, and humpback whales. However, in light of recent controversy over the endangered status of the Atlantic goliath grouper (Epinephelus itajara), it is clear that this often-gentle giant has won the title of “charismatic megafauna”. Charismatic animals are the symbol of conservation campaigns targeted to inspire public concern for the protection of these species, and, more importantly, the entire ecosystem they call home. As a child, I loved beluga whales. I always enjoyed seeing them at the Mystic Aquarium in Connecticut. Their playful disposition and “smiling” faces amused my child-like self. I never thought twice about the implications of putting such social and intelligent creatures in a confined environment. In fact it wasn’t until years later, when I was in my early teens, that I first saw a whale in the wild. That summer, my father took my sister and me to Cape Cod, where we witnessed humpback whales freely swimming, fluking, and breaching in the bay. Witnessing such raw freedom and power was convincing enough – never again would I spend money to see a marine mammal in captivity. Although I continue to hold this stance, I have always remembered that it was these captive animals that first inspired me to further explore the ocean and her wonders. If I had never seen a whale in captivity, would I have ever ventured to see one in the wild? I also recognize that many of these captive specimens would otherwise be dead. In fact, I once helped, for a mere six hours, care for a severely burned and wounded bottlenose dolphin. Through human care and support, the dolphin fully recovered but could never be returned to the wild. This is all too often the backstory of captive cetaceans, including the star of a recent Blockbuster – Winter, the dolphin with a prosthetic tail. A similar story, told of two young belugas rescued from a small, soiled pool underneath a carousel in Mexico, made me sympathetic to the Georgia Aquarium’s captive collection of beluga whales and whale sharks, which were also rescued. General practice, mostly due to public outcry, dictates that aquariums and facilities like SeaWorld obtain marine mammals from trading with other facilities or by rehabilitating or rescuing individuals that cannot be re-released into the wild. However, the Georgia Aquarium’s application to import 18 Beluga whales has both shocked and disappointed me. If permitted, it will mark the first time in nearly twenty years that the U.S. has allowed the importation of healthy, wild caught marine mammals. Although the Marine Mammal Protection Act (MMPA) allows for such removal for the purpose of “public display”, it also prohibits the inhumane treatment of marine mammals. Currently, these 18 Beluga whales are in a holding pool in Russia, where they were captured from the Russian Sea of Okhotsk. This is the primary source for wild caught beluga whales for aquariums and marine parks worldwide, and was previously a popular hunting ground for beluga whales by Japanese fleets. According to the IUCN, which lists the beluga whale (Delphinapterus leucus) as ‘Near Threatened’, there is just simply not enough information to accurately assess that status of the wild population in this region. In order to travel to the United States, these eighteen whales would have to undergo a long and stressful journey, beginning in Russia, then to Belgium, and finally to the United States. The transfer in Belgium must occur because U.S. transport planes are not permitted to land in Russia and, alternatively, Russian planes are not allowed to land in the U.S. because they “do not meet US air and noise emission standards.” In addition, these loud noises may further exacerbate stress levels as the belugas travel from Russia to Belgium. This alone makes the entire ordeal seem unnecessarily stressful and burdensome to both the humans and animals involved. To better understand the process of capturing beluga whales from the wild and preparing them for shows and public display, I have found a brief video from a documentary on the capture of marine mammals. Rather than focus on the capture, this video shines a positive light on the interaction between humans and marine mammals in captivity. It is an interesting look at the facility responsible for the capture and sale of beluga whales in this region. The purpose of the Georgia Aquarium’s permit is twofold: education and research and to replenish the captive stock of beluga whales in the United States. 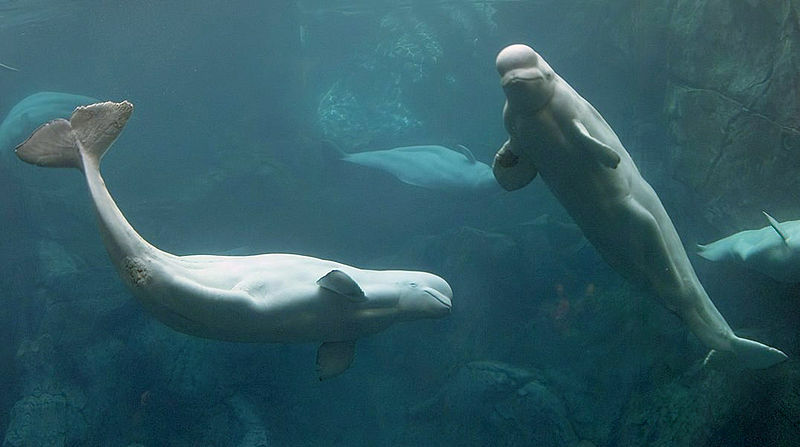 On its website, the Georgia Aquarium defends its application to import these Beluga whales, stating that captive populations must be maintained in order to better understand these species, and thus protect them in the wild. On the first point: there is the question if the display of these creatures will truly serve educational purposes. Opponents argue that facilities such as SeaWorld provide misleading information and often do not accompany shows with any sort of educational message. On the other hand, captive marine mammals allow children and people of all ages to see and attempt to understand these creatures firsthand, which they may never be able to do in the wild. In terms of fostering a healthy, captive population, most of these whales will not remain at the Georgia Aquarium, which already boasts an impressive collection of four whale sharks, four beluga whales, and eleven bottlenose dolphins. While the Georgia Aquarium may have personnel and medical facilities to support and care for its population of megafauna, the conditions these Belugas could face at other facilities, such as SeaWorld parks, the Shedd Aquarium, and the Mystic Aquarium, seem less likely to be of such high caliber. There is deep concern on the impacts of captivity on marine mammals. Despite around-the-clock medical care and attention, beluga whales, on average, have shorter lifespans in captivity than in the wild. Critics argue that comparing lifespans is the “key test of well-being” and that about half of captive belugas die around eight years of age, less than half the median age of wild specimens. These shorter lifespans, as well as a poor record of successful breeding, may further explain why the captive population has shrunk. Only a few months ago, the first beluga whale born at the Georgia Aquarium died within days of birth. Observations of other marine mammals in captivity, specifically orcas, show signs of aberrant behavior, aggression towards other animals and humans, and even depression and emotional disturbance. Recently, a male orca at SeaWorld suffered a severe looking wound. Although SeaWorld claims the wound was caused by the facility, others say they witnessed a fight among three male orcas and that the wound shows teeth marks. Prior to this incident, an orca attacked and killed a trainer at SeaWorld. The long-term effects of placing these intelligent, socially complex, and migratory species in confined spaces are both troubling and reason alone to oppose the importation of any additional wild caught specimens. This begs the question if captive populations can really result in any significant research that could be applied to the conservation of wild populations. It also seems unlikely that the addition of eighteen beluga whales will make the captive population self-sustaining, especially given the scant probability of successful reproduction. Finally, there remains the question of sustainability and the impact of such removals on wild populations. The Georgia Aquarium and four other “public display” facilities sponsored a study by the IUCN entitled the “Sustainability Assessment of Beluga Live-capture removals in the Sakhalin-Amur Region, Okhotsk Sea, Russia.” Interestingly, the Georgia Aquarium website states “the findings tell us that the acquisition and import of these animals has absolutely zero negative impact on this very robust native population in the Sea of Okhotsk”. However, this is not the same takeaway that I had from reading the study. The IUCN document, although brief, does not state any clear conclusions other than that more research is needed in order to determine the number of beluga whales that would be considered a “sustainable removal”. The study is hesitant to draw any definite conclusions, stating that survey methods to determine population sizes and characteristics are not entirely reliable. Furthermore, the study states that the population of belugas in this region was subject to significant, large-scale commercial whaling from 1917 until 1963, supposing that it ended simply due to the sheer depletion of beluga whales in that region. After hunting ended, the capture of live belugas for “public display” began in 1986. According to the document, Russia is the sole regular supplier of belugas to the aquarium and marine park industry. Thus, while eighteen beluga whales from Russia to the United States may not seem like a significant number, this does not take into account the number of belugas that are being caught and sold worldwide to other aquariums and marine parks. I am also concerned that the allowance of this permit will open the door for other, similar applications, which would potentially exacerbate the worldwide extraction of belugas, bottlenose dolphins, orcas, and other marine mammals for “public display”. It seems that there are enough anthropogenic and natural factors driving marine mammals to shore, which in turn significantly impacts the wild population while potentially providing “rescues” to these facilities. Up until now, the entire stock of megafauna at the Georgia Aquarium must have been obtained as rescues, either from other countries, such as the two beluga whales, or from within the United States. Thus, I strongly feel that the Georgia Aquarium and other marine parks will be able to continue to have a small population of captive marine mammals that have been rescued, rather than taken, from the wild or from other facilities that are not properly caring for these intelligent, but delicate, creatures. Despite its attempt at sounding noble, I view this permit as a sheer act of greed and disregard for the wellbeing of creatures whose intelligence, social structures, and needs needs we do not yet fully understand. Rather than spend money to place these marine mammals in oversized swimming pools and pretend the results can be applied to wild populations, research institutes and aquariums should shift the paradigm to support fieldwork to study marine mammals in the wild. Although a public hearing has already occurred (12 Oct. 2012), the National Marine Fisheries Service has an open public commend period until 29 October 2012. If you feel strongly against this application to import 18 Beluga whales to the United States for the purpose of “public display”, then I encourage you to speak your mind and submit a public comment. Talking Points, prepared by Naomi Rose at the Humane Society International, that you can include in your public comment. In case you didn’t read the whole blog entry, or you want to read more, check out this summary of the issue by the New York Times.